The book is interesting not only from the individual perspective but also from an organizational one. If an individual is more likely to be effective using one approach rather than the other, an organization would be wise to encourage the right approach through its structure and culture. The research behind the recommendations suggests that many of our typical assumptions are wrong. Though some of these inconsistencies have been highlighted before (in my observation), some are new and eye-opening. Very often, if something is not quite “right” at work, our typical answer is to invest more resources – time, from the individual perspective. The research suggests it is not the answer. 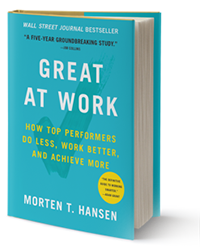 Based on the analysis of successful employees, the author identified seven principles of “working smarter,” which would be helpful for both employees and organizations. A focus in general has been encouraged by the industry for a long time. Now, we have data. The interesting part is that the focus itself is just part of the answer – investing enough energy into the few selected priorities is needed to succeed. This approach also helps with managing work-life balance and improves overall well-being. What can an individual do to bring more value to the organization in his current role? A person can identify and emphasize more valuable activities and automate or minimize less valuable ones. The individual can also tailor the role to his strengths and interests to feel happier at work, what will encourage engagement. My guess, this principle can apply to any form of focussed learning suitable for a position. Following the industry news or learning new technical aspects of the job could be very helpful. However, the author concentrates on the behaviors rather than technical skills. To start improving a skill, effective learners in the workplace break it into manageable chunks, what I call micro-behaviors. A micro-behavior is a small, concrete action you take on a daily basis to improve a skill. The action shouldn’t take more than 15 minutes to perform and review, and it should have a clear impact on skill development. An interesting example was the journey of a new manager of the food service in a hospital. The manager worked with a coach to learn how to encourage her team to bring up new ideas. Though first attempts were not as productive as desired, in time, the manager was able to encourage her team to bring up dozens of suggestions and make a significant impact to the business by implementing many of them. The author is one of few brave and confident voices who suggest not to “follow your passion” blindly, which can lead to financial ruins (excellent examples in the book! ), but to find a passion in a current or adjacent area of work. A great example is a story of a sales executive, tired from his role in a large company, but not quite willing to take a risk of leaving a respected and well-compensated position. After a year or reflection, the executive proposed to take his company in a new market. This move created a “startup” within an established business and was highly beneficial both for the employee and the organization. Interesting, this approach has a negative effect on work-life balance, as the person is willing (often happily) to spend more energy on work projects and continues thinking about them during his personal time. Top performers master working with others in three discrete areas: advocacy, teamwork, and collaboration. Finding supporters of your ideas within the organization is very helpful. This recommendation might be more useful on an organizational level rather than an individual one. However, it is possible to implement in a team setting. The meetings should allow and encourage “fighting” over the topic – lively debate with controversial suggestions and immediate criticism of proposed approaches. This type of discussion encourages innovative solutions to appear and evolve through the discussion. However, when the decision is made, the entire team should unite behind it and implement agreed-upon solution without “re-negotiation” attempts. This principle was the most surprising for me. Th author clearly showed that the collaboration might not be always effective. In some cases, it may not increase the success of an effort but just increase time. In other cases, the collaborative project may not have enough of “unifying goal” and resources to be successful and doomed to fail. The author suggests selecting carefully when to get involved in collaborative projects and when do not. An interesting example: a firm drastically encouraged collaboration. Some teams benefited (based on the number of successful deals) and some did not. The reason was unexpected: less experienced teams benefited from a more experienced advice, though experienced teams did not, and just wasted time on soliciting less knowledgeable opinions.